Looking through this beat up notebook made me think about where I’ve been and where I’m going. It’s tough “seeing” everyone online post a million journal articles, often times, concluding different things, X person landing this job or that job, Y person using this awesome piece of technology…it really can make you envious at times. If you’re reading this, you too are engaged in the process of social media, the Internet (I think Jay and Silent Bob said it best), and are great observers of the Information Era that we’re currently in. However, how did the great coaches, leaders, etc. do it back in the day? Even yesterday? 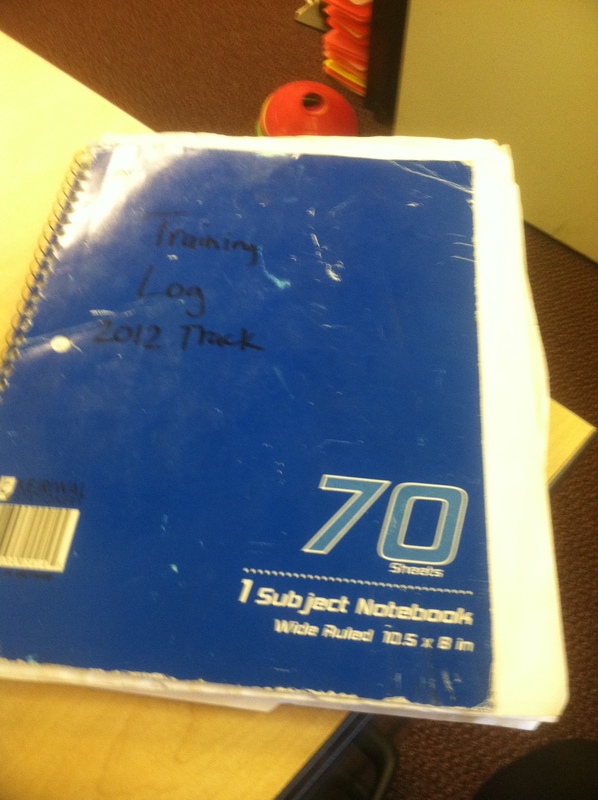 2012 – Old School Notebook to report training exercises, splits, notes, observations. What has been very clear to me is that the best coaches today kept great notes, problem solved their way through their errors, and had great mentors. I’m 30 and the advice I’ve heard the most is to find a mentor. I understand this is pivotal, however, I think it’s what people wish they had, that is, someone to help them skip over mistakes. Yet, its the errors where good coaches yield into great coaches. Now, you don’t always need to make the same mistakes over and over, but, the process is necessary to be a great coach. It’s one thing to read the classics on coaching, and it’s a whole other learning process to prescribe training the way they did. 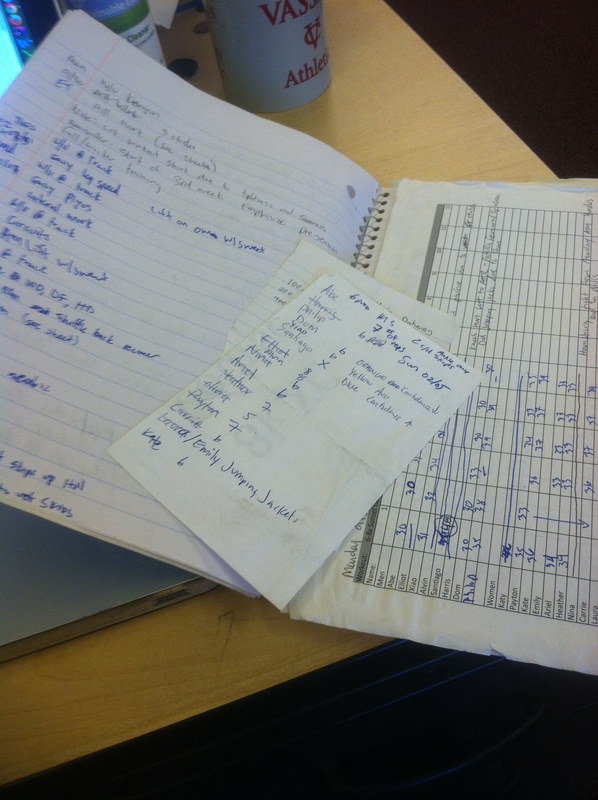 2012 – Crap all over the place, recording splits and reps done on random pieces of paper, and in printed spread sheets. Maybe we should require a period of time in the trenches prior to finding your mentor or observing a practice. 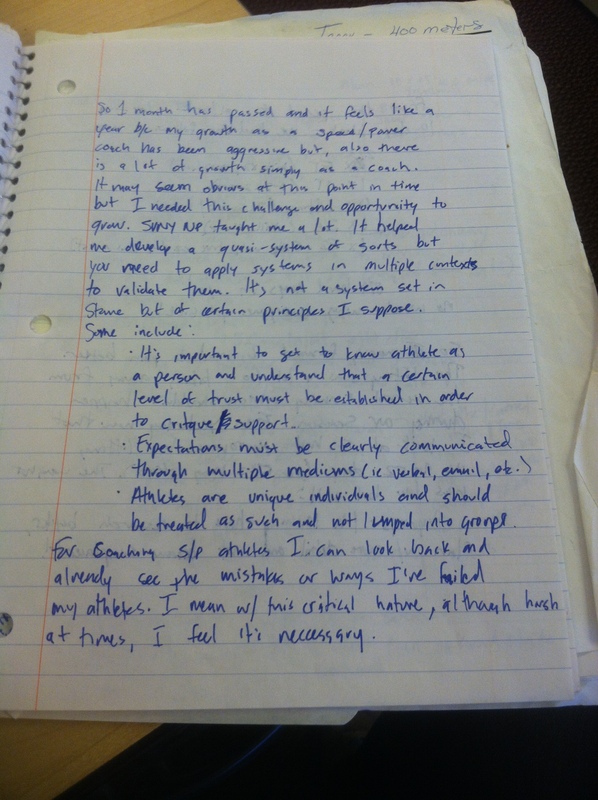 What I learned from the World Athletics Center Apprenticeship (WAC) was great. It confirmed I was on the correct path, to keep my course, and to check in every now and then when I get stuck. Its called facilitation. But, what if I went as a 1st year coach? I think many things would have flown over my head. 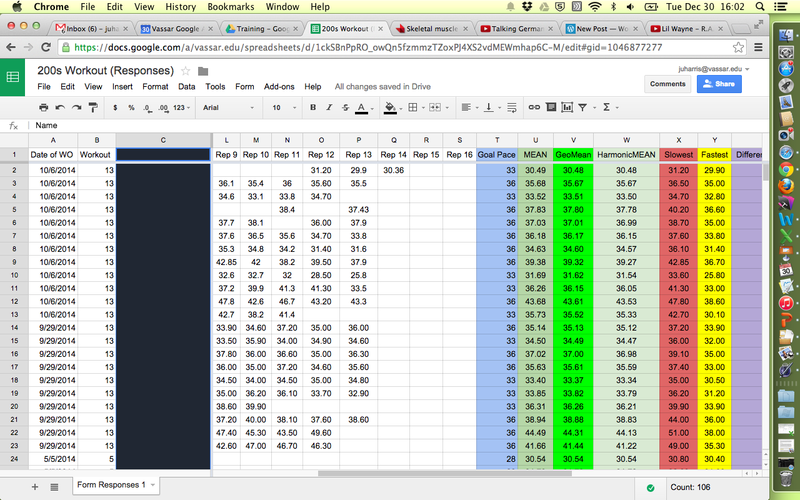 2014 – For repeating workouts I built a Google Form so I can input splits and can calculate things immediately instead of using a calculator to figure out things. 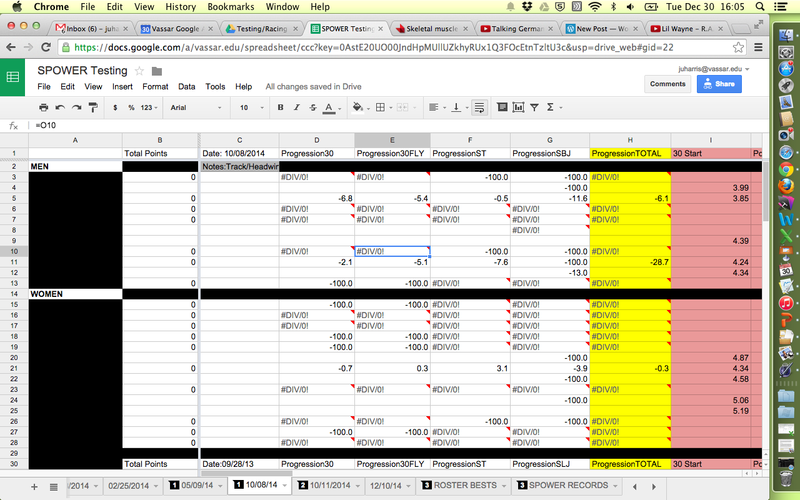 2014 – Now I share training blocks in Google Drive prior to training so athletes are aware of what is coming. It’s easy to get caught up in wanting to see EMG readings of athletes’ movement patterns, do blood work everyday for overtraining, and HRV for a look into the adaptation process. Trust me, this stuff is exciting and coaches need to know the intricacies of these (and more), however, as my Master’s Advisors’ have instructed me, you really should do the simple things first. And, I understand this isn’t rocket science but, maybe I needed the reminder after surfing the Web, Twitter, Facebook for hours bouncing around from idea, to research, to theory, back to more ideas, etc. Early on you must figure out what to assess and how often. Me, who hates not knowing things, tested here or there at first, and then moved to testing on a consistent and regular basis at similar time periods each year. I begged Boo Schexnayder and Todd Lane after taking my Jumps Specialist Course to please tell me how you assess the assessment. As great coaches, they reassured me I was doing good stuff but, it’s different for each school, coach, program, etc. C’MMON MAN! 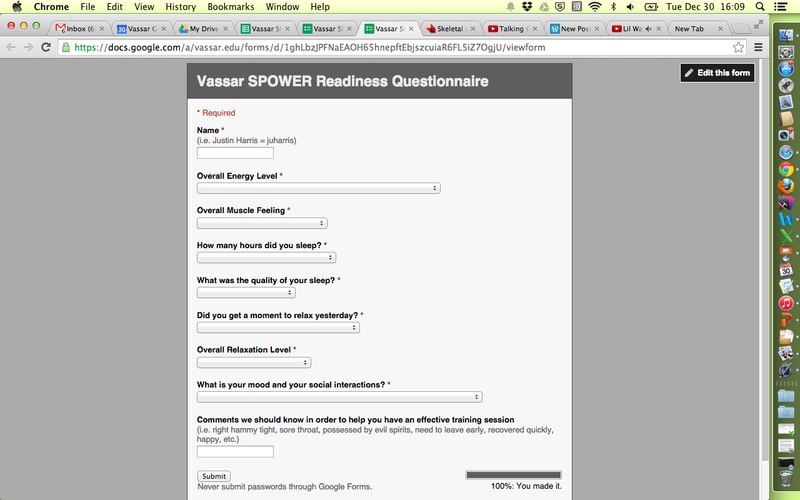 I wanted the magic pill/answer. So, I figured I just keep the data and build from there. As I built simple data – no data mining here (yet or maybe never) – it builds a clearer picture of how my prescriptions affect an athlete. Look at the difference between almost 1,000 days of coaching. 2014 – Day 994 (seriously, I calculated it!) Learning how to represent improvements instantaneously and progressions from one period of testing to the next. When people talk about max strength hurting max velocity I didn’t really understand it. Until I tested my athletes after a max strength block. 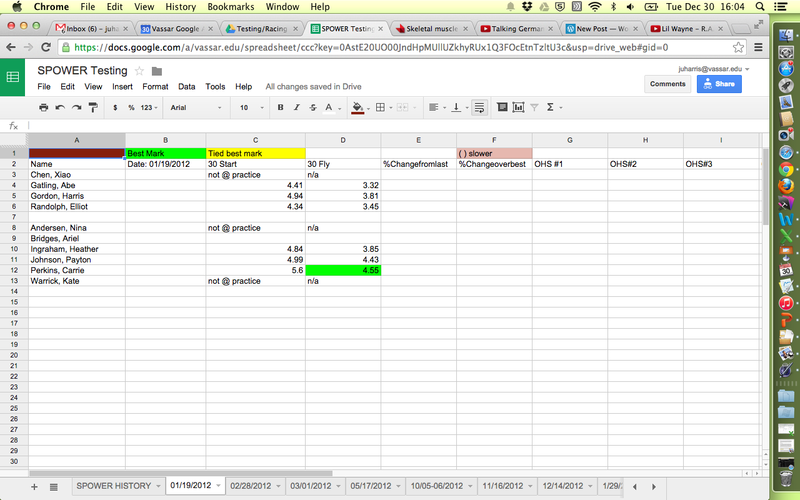 Acceleration (30 start) improved and max velocity (30m fly with 20m run in) got worse. Now I know why and can kind of plant that seed with my athletes that they can expect that (and that its a good thing at the period of time we do it). So, what happens on the daily? Great question. I think many people guess, or over time they build up the answer. However, sometimes the athletes have a tough time communicating to coaches. Actually, its a problem in society these days. I stole this from Mladen Jovanovic (maybe Carl Valle too?) but, the idea is to track certain daily measures. I chose a 10 point rating scale and to define each rating so athletes get on the same semi-objective scale. It is still subjective, but, aren’t fatigue/pain/sickness all behaviors that depend on how the individual perceives the world? I think so. And, there are enough studies that have tracked many parameters with expensive equipment. If you look hard enough you can correlate their findings to simple questions on the questionnaire about energy, fatigue, muscle soreness, etc. So, every day we ask the athletes to do a quick questionnaire on their smart phones. It takes 2 minutes and answers compile in a spreadsheet. We look at it daily in the raw data format, which can cause us to miss some stuff but, we don’t use this as a complete assessment for the athletes. We still go and talk to each athlete. However, where it does help is getting the information 1-2 hours prior to practice and having the time to game-plan the best alternative training session if an athlete needs one. 2014 – Athlete Readiness Breakdown for each athlete. We’ve been doing the questionnaire for 1.5 years and I’ve been thinking of how to break it down. 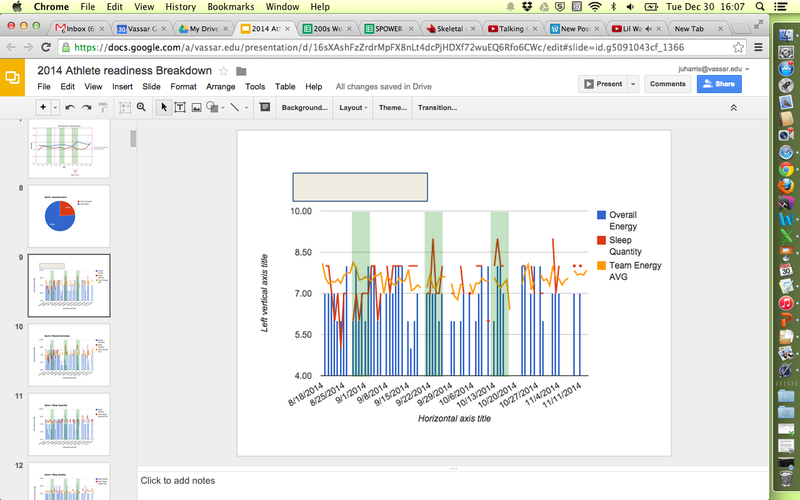 Honestly, just this year I improved my spreadsheet skills and it helped me figure out how to set up the data and figure out what graphs to use so I can understand the information visually. The information presented some interesting observations about college student-athletes perceptions, fatigue, sleep quantity, etc. and about our own training programs and philosophies. At the WAC, I saw the standard set high with assessing athletes during the warm-up and throughout practice. If someone directed me into the general area to be looking, I generally could see the issue. But, the body has a lot of moving parts and I need to get better at understanding how they work together in unison, as well as, noticing dysfunctional movement. Add winter layers and it’s going to be tough, however, I know its vital to be knowledgable in this area. I certainly have room to grow in this area. We often want to be able to perform magical feats that impress everyone, and yet, the truly amazing people in this world have paid their dues and have worked incredibly hard. When are we going to start rewarding the work behind the scenes instead of focusing only on the result? There is no long-term successful result without a great process that preceded it. So, pick the easy stuff to work with first. Get in the trenches with it.